The morning of the race (I signed us up for a 12:20 wave, thank you!) it was 38 degrees and was to warm up to 55 or so thank god. Ed picked me up at 9:45 and we then scooped up Ronny and Jim before heading out of the Lincoln Tunnel. I’m not gonna lie. I looked for all possibilities to get out of this one. You see, COLD, is my greatest weakness. 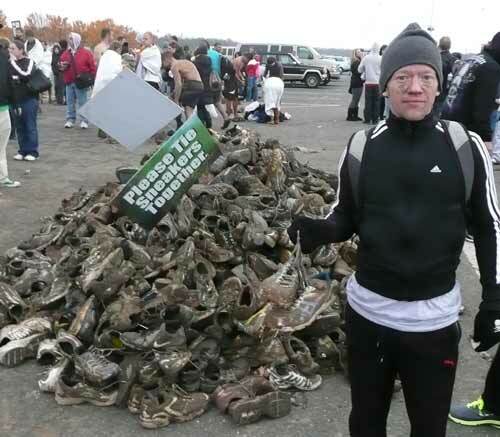 (note to all opponents) SIDENOTE: Once the NYC Marathon was over I got very nervous. I knew I had this race coming up and I told myself ‘I would rather run another marathon than attempt this mayhem.’ But, we must confront our fears. The car ride camaraderie was just what I needed. As we entered the park grounds and saw what was taking place we were all instantly excited. We had a full 360 degree view of a lot of the main obstacles and the race was crossing our path at certain points. Gearing up I had on tri shorts, running shorts, a long sleeve tech top, racing flats, Zensah calf sleeves and bike gloves. We made our way to registration and basically signed our life away. 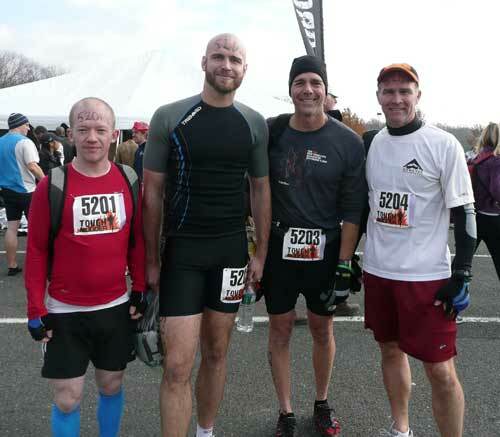 Waves started at 9AM so we got to see guys coming in from the race who were shivering and covered head to toe in mud. Please remember how clean and well kept all of us look in this photo. Lining up at the start, which was a drag race track, we had the sun shining on us but the wind was fierce. It would be our main opponent all day. 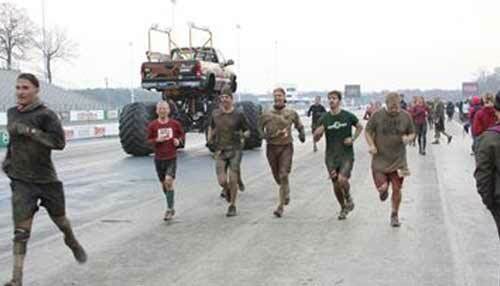 A few words (including the tough Mudder motto) and we were off as a monster truck led us out. We ran the length of the track and back which was maybe a mile, then veered off onto obstacle 1 of 18. It was the “Ball Shrinker” which is a rope overhead, rope below walk across a freezing lake. Ronny was in front of me (did I mention Ronny is 6’3″) so my foot rope was unreachable at times, therefore I used my upper body strength to ‘monkey bar’ it across. The water was numbing and our feet burned as we got on dry ground. Running along the lake I knew it wasn’t long before we had to take a dip in it and really start to feel some pain. 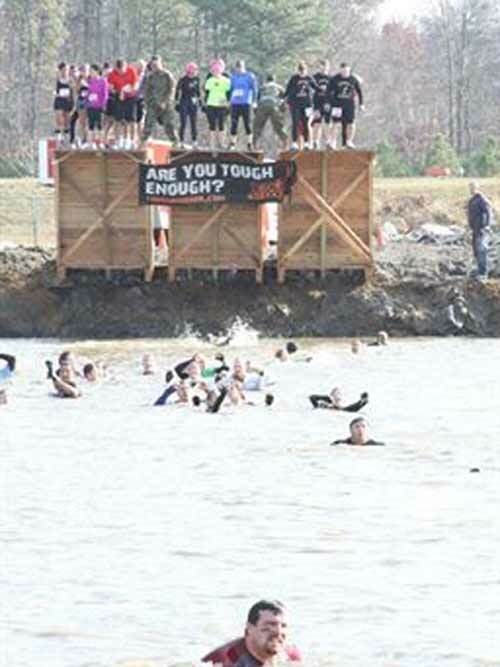 “Walk the Plank” is where you rope walk up a wall then jump off (20 FT) into a freezing lake. I didn’t think it would be too bad, I was wrong. Jumping off the platform and into the lake was fun, but as I hit the water my body went into shock. My strategy was to use my triathlon skills to freestyle swim across the 50 yards to the other side. After 3 head dips I became delirious from the numbness in my skull and decided I had to keep my head above water. My body was shutting down and for the first time in awhile I was deathly afraid. Speeding forward I met the “Underwater Tunnels” which was a series of barrels you had to swim under. Once again my brain was frozen, but somehow I made it to the shore. Running along the bank, we all talked of how our bodies burned due to the cold. THEN, we had to cross the freaking lake again! This time the water seemed warmer? I breast stroked it the whole way and may have set a world record. 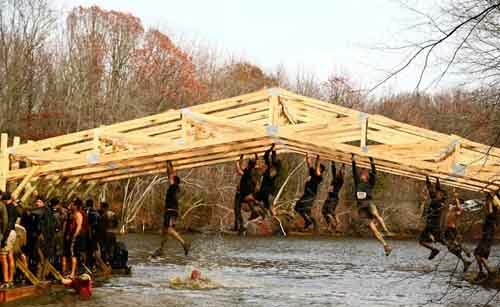 Exiting the lake, we had to run maybe a mile until the next obstacle, warming us up I guess. 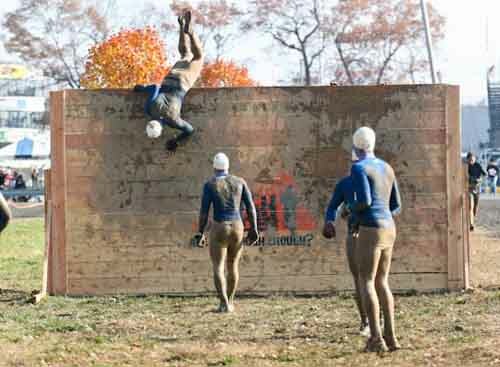 Next, we hit the “Spider Walls” followed by the “Mud Mile.” Did I say mud? From here on out MUD would be the theme of the day. “Mud Mile” is a series of pools that were waist high sludge mud with hills between. Think chocolate milk meets Jell-o Pudding. On the first hill I tripped and went headfirst into the mud. The guys laughed at me. We were really having fun now and our spirits soared. 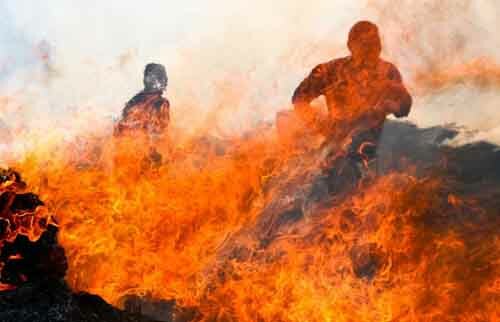 The fact that our extremities were numb and burning seemed unimportant. Next we went onto a dirt bike course which was a muddy series of ups and downs. I really can’t even begin to describe the mud. It was also very challenging to run on. You have to constantly watch how you place your feet so you don’t really twist an ankle. There were always huge holes under the mud where you would sink in, sometimes up to your waist. Winding around and around, we arrived at “Cliffhanger” which is a huge assent up a 50 ft muddy incline. I didn’t make it on my first try and had to approach from a different angle. 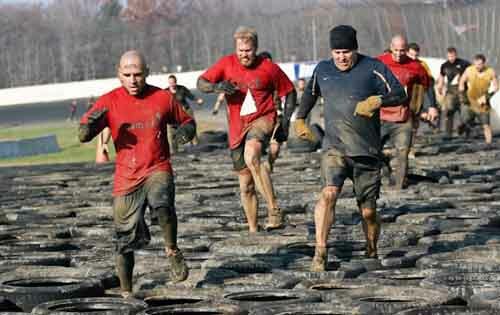 Luckily, the name of the game is to help fellow Mudders, so some guys (forming a human chain) grabbed me and pulled me up. 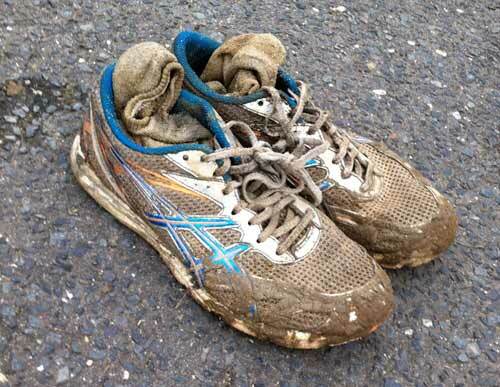 SIDENOTE: Don’t wear racing flats in the mud. 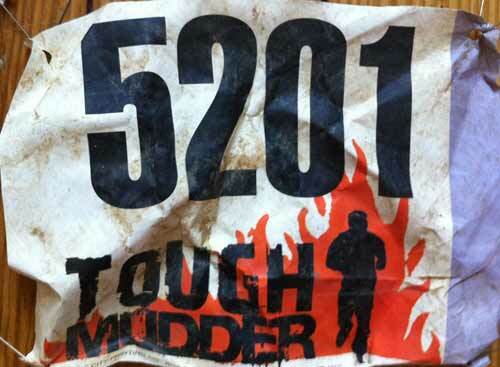 Now we had to hit the “Kiss of Mud” which was a barbed wire net you had to crawl under in the mud. It was messy, but hey, it wasn’t even close to as bad as the lake jump so we were smiling. After a quick 1 mile jog we had to go through the “Boa Constrictor Tunnels” which were 50 feet long, and 2 feet in circumference and covered with rocks and mud. Not fun. Next we hit the “Berlin Walls” which are series of 3, 10 foot wooden walls. We nailed this. Ronny would jump up and straddle the wall, then I would go and he would pull me up, followed by Jim, then Ed. Military science at its best. Speaking of which, at this point, looking around at everyone scaling walls I couldn’t help but appreciate our U.S. Armed Forces and my friend Cory. I thought to myself “Baker, this is probably the closest you will ever be to the military, enjoy all of it!” And I did. Another long run and then we arrived at the “Tired Yet” obstacle. A million tires on the ground that you had to run through like a football drill. I was really excited about this because I never played or tried out for football so I wanted to see what I was made of. I did well. Right after was the “Rubber Necking” obstacle. 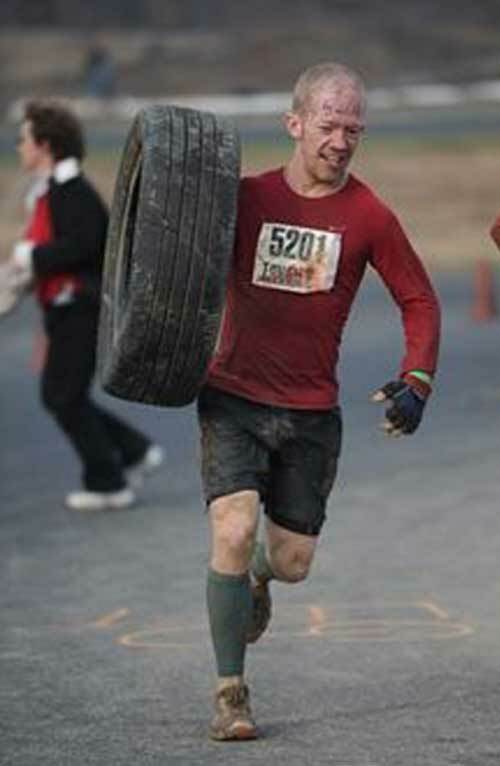 Grab a tire and run it 1/4 mile to the drop point. This was easy. We were about halfway done the course at this point and frozen to the core, so seeing the burning fire pits ahead excited us. 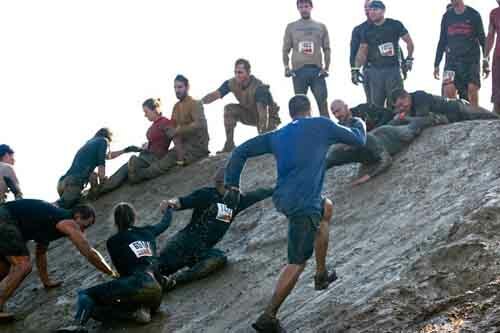 Remember, this whole time we were all running together as a team, that’s what Tough Mudder is all about. Cruising up on the smoke filled area (patrolled by the local Firemen) we ran through a track laced with burning hay bails. It was really hard to see with the smoke but the heat felt so good! Next we were back on a dirt bike course weaving along, up and down the muddy hills again. Mud, Mud, Mud, all day. Ed took a really nice digger that would later leave him with ‘Most Muddy Award.’ Really though, I’m so surprised no one twisted and ankle seriously injured themselves! We had to dip under the “Devils Beard” obstacle which was a 50 foot long rope net you had to army crawl under in the cold mud. Awesome. After running in the mud for 2 more miles we entered the forest. It was very peaceful and for some reason there were less Mudders around. We had to leap over fallen logs (the “Log Bog Jog” obstacle) before running into a mud pit that was crazy hard to get out of! Ronny actually jumped the whole thing which the rest of us hadn’t thought about! I really thought I wouldn’t have to get into freezing cold water again. Wow. I was wrong. After a 1 mile stint around a lake we approached the “Funky Monkey” – “Twinkle Toes” combo. Alright here it is. Greased monkey bars over a lake that have an incline, apex, then go down to a platform. Next, you walk across a thin beam to the shore. Easy right? 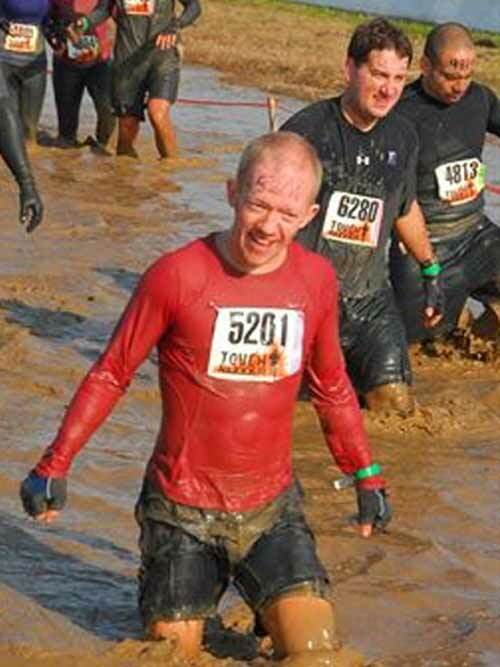 How about being covered in mud and totally shivering cold? Exactly. Going first, I ditched my gloves thinking that would make it easier. I made it 2 freaking rungs before falling in! Lame! I swam to the platform. Then, 2 steps into the beam I fell in! Double Lame AND I was soaked and freezing. The rest of the guys did way better than me, all of them making it across the thin beam. 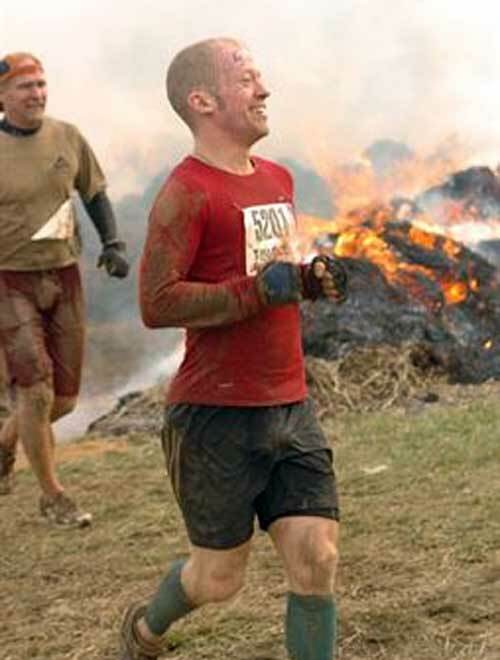 Finishing that obstacle, I knew the hardest part of the day lay behind us. We had to hit some tunnels again before entering the race track where we started. 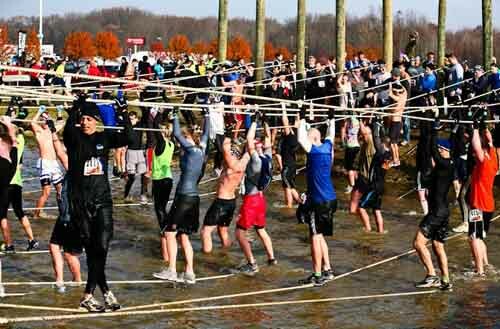 The 18th and ‘Secret’ obstacle was a bunch of electrified wires hanging down that you had to run through. Seriously! I got hit once in the right shoulder should sent a shock wave through me, but whatever, I was frozen anyway! 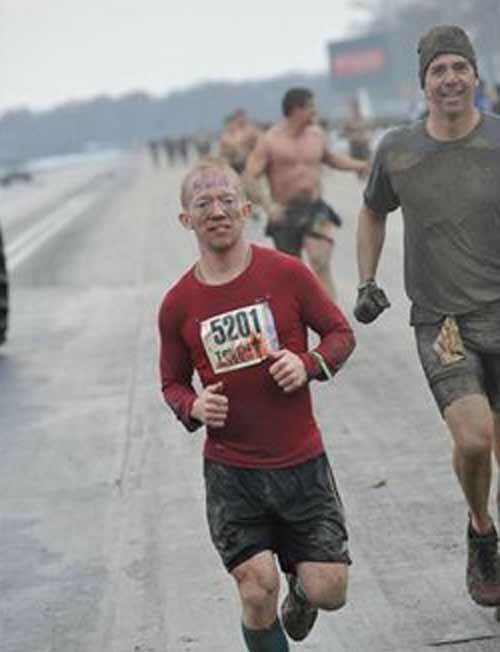 After that there was a half mile jog around the track to the finish! We were so excited! Probably the hardest part of the whole day was peeling off our clothes and putting on warm replacements. Impossible! I had my socks half way on and just gave up, jamming my shoes on over them. We grabbed our free beers and hung out by the fire pit before heading off to a diner to have a big meal. 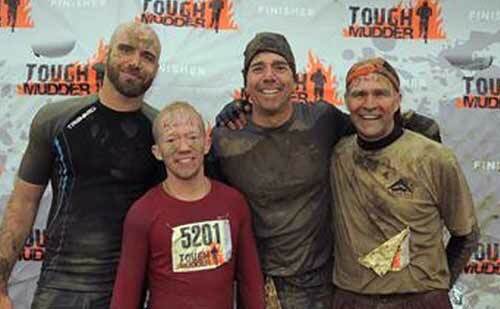 We were all Tough Mudders now and I really believe in it. Even now as I type this some 7 hours after the finish my fingers are still tingly. It was really quite a fun experience and I really enjoyed the team effort, instead of the usual ‘every man for himself’ attitude. It also hardened me up, so maybe now I won’t complain during those easy races in Central Park during the winter!